On May 29, 2003 my daughter, Taylor, was diagnosed with cancer. She was eleven years old, and in school that morning without a care in the world; by nightfall we were told she had advanced cancer. Taylor’s only symptom was shortness of breath while playing sports. Otherwise she appeared to be the picture of health. Weeks earlier, her pediatrician had diagnosed her with exercise-induced asthma and we were following up with a specialist in an effort to sort her medicine. You can imagine our horror when a routine pulmonary exam revealed this shocking diagnosis. We didn’t have time to read a book or search the Internet to glean ideas about how to tell Taylor the news; it all happened so quickly. However, in retrospect, even if we had consulted sources it still would have ultimately been a very personal decision, guided by our child’s age, emotional intelligence and personality. For us, telling Taylor she had cancer was terrifying, but we intuitively knew it was imperative for my husband, Bob, and me to stay calm and not allow our fear to reverberate to Taylor. She had to believe that no matter what, her parents would make everything better. Bob and I had a brief discussion about what to do. I headed home to somehow tell our other two daughters their sister had cancer and pack a bag for a hospital stay of unknown length. As unimaginable as that seemed to me, I didn’t envy Bob his task. He had to tell Taylor. The first question left him breathless, but this one left him hollowed out. He thought, How can I be holding my little eleven-year-old daughter and be answering this question? With grace and strength, he answered, “Tales, we all have to die sometime, but this is not your time.” She looked at him for a few seconds, seemed satisfied, and never, ever, asked the question again. We felt it was very important to tell Taylor what was going to happen in the coming weeks and months because we had to establish trust. Together, my husband and I decided never lie to Taylor, although we didn’t always tell her everything we knew. Being honest with her allowed her to feel safer and more in control because she was never left to wonder what was happening or what her next steps would be. She knew that on some nights Bob would stay up half the night researching her disease and formulating questions for her team of doctors. She was 100% secure in the knowledge that, at all costs, we would never stop advocating for her. The weekend following diagnosis she had so many visitors that the hospital asked us to go downstairs to the lobby. Taylor was thrilled that so many people cared about her, was excited about all the gifts and candy, and was laughing and playing as my joyful Taylor always did. As I watched her it broke my heart; I remember thinking that Taylor had no idea about what was to come. Actually, none of us did. One thing we all did comprehend was that Taylor was going to lose her hair. About a week into diagnosis, listening to the sound of running water while Taylor was in the hospital shower, I silently sobbed knowing it would be one of the last times, for a long time, she would feel the suds cascading down her long chestnut-brown hair. I shivered as I heard the clanking of the rusty faucet turning off, quickly wiped my tears, and thought about the person Taylor was inside. Was I the only one anxious about this? She was beautiful but never vain. Maybe Taylor would be okay with the dreaded words a mother never dares to think she will have to tell her daughter. When my angel came out of the shower wrapped in two towels, one on her head and one on her body, I gestured for her to come cuddle on my lap. As I caressed her face, I gently explained, “Tales, within two weeks, you are going to lose your hair.” She didn’t say a word, tightened her grip around my shoulders, and breathed deeply, taking the air from my lungs directly into hers. A few tears silently slipped down her porcelain face, wetting my sleeve. She peacefully rested her head on my shoulder. The moment was so tender. We held each other for as long as I can remember, and although the circumstances were dire, it is those times that I cherish the most—the moments of sheer unconditional love shared between mother and child. As her wet towel and soft tears dampened my shirt and shattered my heart, Taylor taught me the first of many life lessons. No one would wish cancer on his or her worst enemy, but there can be some good that comes out of it. If you let it, cancer slows life down just long enough to afford you opportunities to hold close the ones you love, breathe in their scent, feel their skin upon yours, and unwaveringly thank God for bringing them into your life. As long as we had each other, nothing else mattered. 1. Try to remain calm and hide your fear in front of your child. The best place to cry and scream is the shower where you can’t be heard. 2. Most children believe their mommy and daddy will make things better. Taylor needed that reassurance. 3. Remind your child that either you or a loved one will be with them at all times. They need to know they will never be alone. 4. When speaking with your child guide your conversation by their responses both physical and emotional. 5. Many hospitals employ Child Life Specialists. They can help you if you are not sure how your child is feeling. Through play techniques they can ascertain a lot about your child’s state of mind. Don’t be afraid to ask them for help. 6. Explain to your child what to expect in small doses. 7. Remember above all that Love is All You Need. Love transcends all. 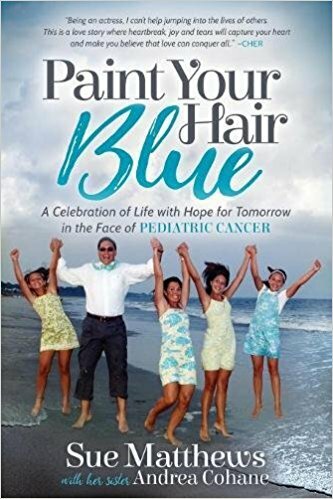 Sue Matthews, along with her sister Andrea Cohane is the author of Paint Your Hair Blue, a mother's longing to give enduring eloquence to her daughter's voice, to not let it go silent. Readers will come away from the book with a vivid understanding of how truly short and precious life is and a greater willingness to add more color as we go along.